Two different flukes in one trip! 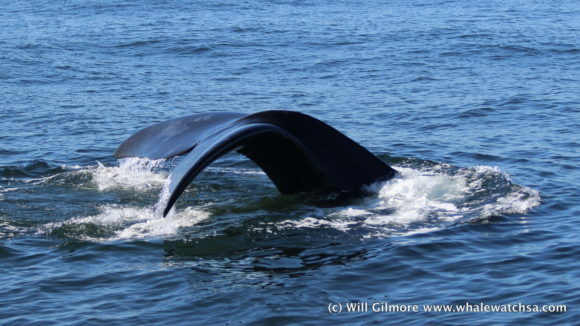 After almost a week off the ocean, we could not have asked for a more exhilarating return. 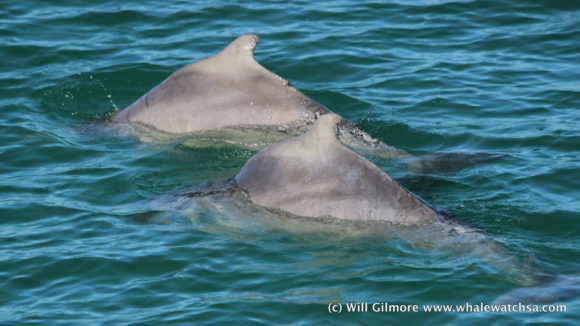 It started off with a pod of Indian Ocean Humpback Dolphins. 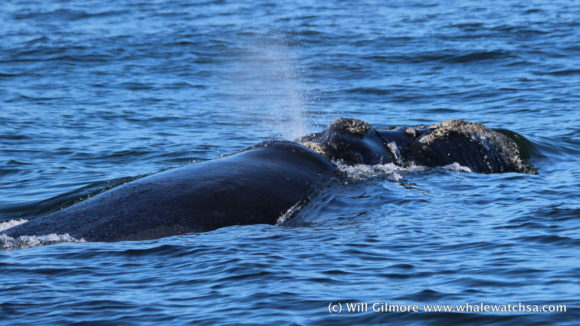 Usually, we only see one or two individuals but today we had seven around the vessel, including a mother and calf. 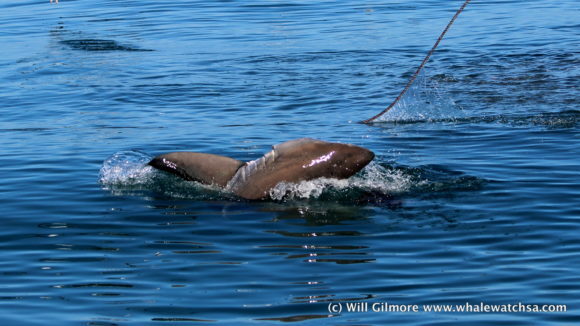 As we spent more time around the pod, they became very playful, one even began to breach, tail slap and lob tail for us. 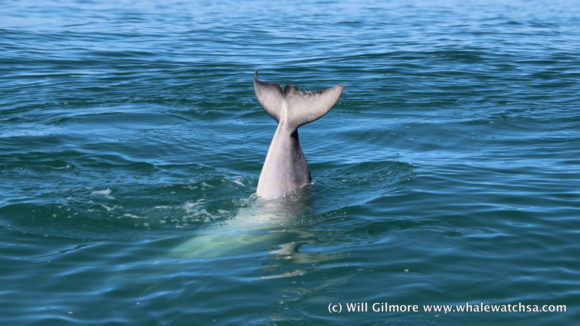 The humpback dolphins are generally quite shy so it was great to see them playing in this way. Our next sighting was a very exciting great white shark at the cage diving site. The shark charged at the bait and decoy a few times; however, the crew was on form to pull the lines out of the sharks’ mouth. Less than half an hour into the trip, we had seen two members of the big 5 already. The next stop on our trip was the front side of Dyer Island, we stopped here for a while and watched the birds’ wiz past our heads, these birds included; species of terns, cormorants and gulls. We slowly continued around the island into sponge bay to try and glimpse the smallest member of the big 5, the African penguin. There were quite a lot of penguins on the island, but they were occasionally just out of sight behind the thousands of cape cormorants. 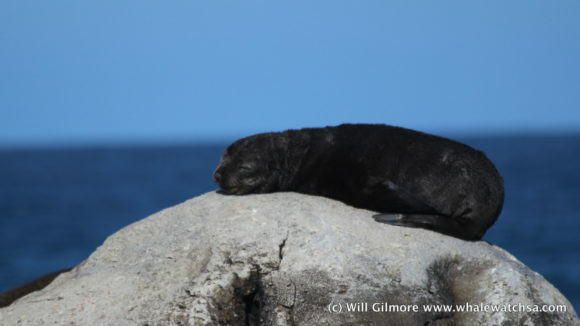 We left Dyer Island behind and headed into the world-famous waters of shark alley to say G’day to our 60,000-strong cape fur seal colony. The colony is always entertaining both in and out of the water, many of the juvenile males were fighting one another as practice for when they are large enough to fight for mates. The pups were also causing a commotion in and out of the water. 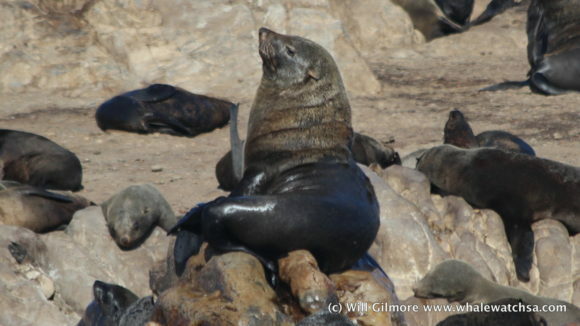 We then set off behind Dyer Island to tick of the last member of the marine big 5. 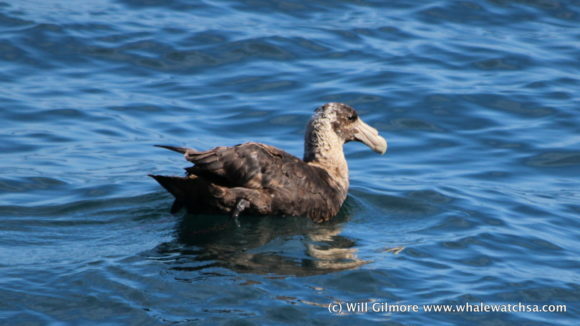 As soon as the vessel had turned out of the alley, the crew spotted the spout of a Bryde’s Whale amongst a group of foraging sea birds, including; sooty shearwaters, corey’s shearwaters and even the beautiful cape gannets. As we approached the site of the spout, we scanned around for a while to no avail, the whale did not resurface. 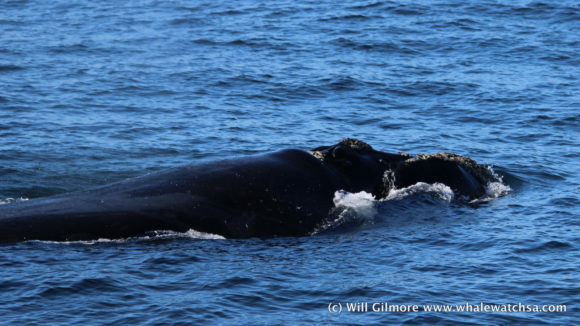 However, we set a new course towards danger point where we came across the most exciting sighting of the day, a lone southern right whale, our second sighting within a week. 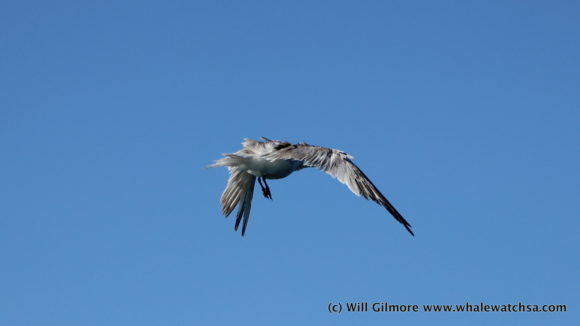 It is still a little early for our southern rights to be visiting for the winter, most are still fattening up in the Sub Antarctic, feeding of species of krill and plankton before making the arduous journey north. The whale was very calm and relaxed around the vessel, swimming parallel with us for most of the time. It offered us some amazing views of the callosities on the head. Just before the whale decided to say goodbye, it gave us one last awesome movement when it lifted its whole tail out of the water as if to say goodbye. A truly awesome sight. 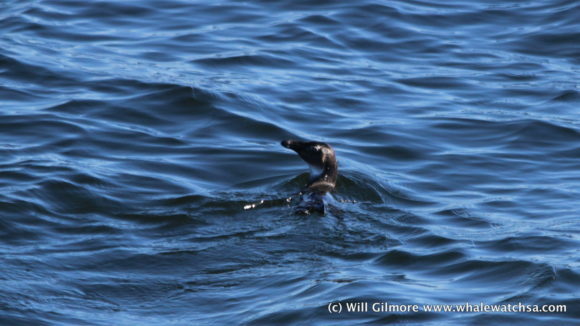 We then slowly made our wat back to the harbour, along the way we came across one juvenile and two adult African penguins floating in the water, wrapping up an excellent day at sea.